Open the door of your pantry and take a look. Do you see a jumble of cans, half-finished bags of stale snacks and expired spices you forgot you bought? Keeping your kitchen cabinets in order not only makes it easier to find what you need, but it can help you save money by helping to avoid purchasing items you already have. But most homeowners don’t have a system when it comes to organizing their shelves. Use these simple tips to keep your pantry neat and tidy. Use clear containers. Food comes in dozens of different-sized packages. Sometimes, arranging them in your pantry is like playing Tetris, and it is difficult to see how much of each item you have left. Instead, remove food from its package and put it into stackable see-through containers. Not only will you be able to increase your storage, but you will also be able to quickly determine when it is time to add something to your shopping list. Don’t forget the directions. Using separate containers is excellent, but getting rid of old packaging means losing the instructions. Always cut out the directions from the package and tape them to the top of the container, so you will still know how to prepare the food. Remember first-in, first-out. When you buy a new package of something you already have in your pantry, don’t add it to the container you already have. Put the fresh food in its own container and place it behind the older one. Make sure to label the item and include its expiration date, so you will never throw out perfectly safe food ever again. Install a shelf for small containers on the pantry door. 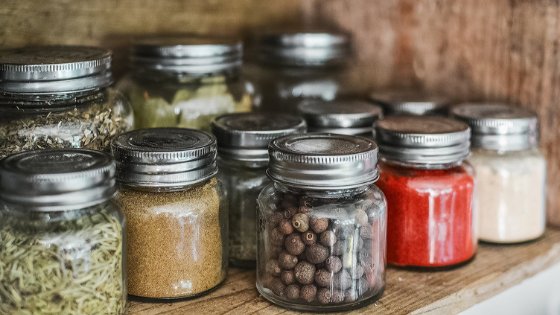 It is easy for small bottles of spices or packets of soup mix to disappear in your pantry. Adding a shelf to the inside of your pantry door keeps all of these small items within easy reach and out of the dark corners. If you don’t want the hassle of installing shelves, consider wire baskets from the top of the door. In addition to organizing your kitchen, finding great apartments in North Dallas also doesn’t need to be a struggle. Gramercy on Park provides easy access to downtown Dallas while offering sought-after amenities. Call 866-350-7648 to arrange a showing of available units.